Training a Silky isn’t just about tricks, though they can be fun. It’s about having a good time with your dog. While “everybody knows” that big dogs need discipline and dog classes, training a Silky isn’t quite so obvious. I’ve long felt that small dogs get a bad rap around trainers and owners. It’s the “Awwwww isn’t he cute” factor that allows small dogs to get away with the kind of murder no one would let a big dog do. Once a Silky Terrier gets used to pottying in the house or barking his head off or pulling like a sled dog, it becomes “normal behavior”. Not so cute any more and definitely caused, not by your delightful cutie, but by YOU. 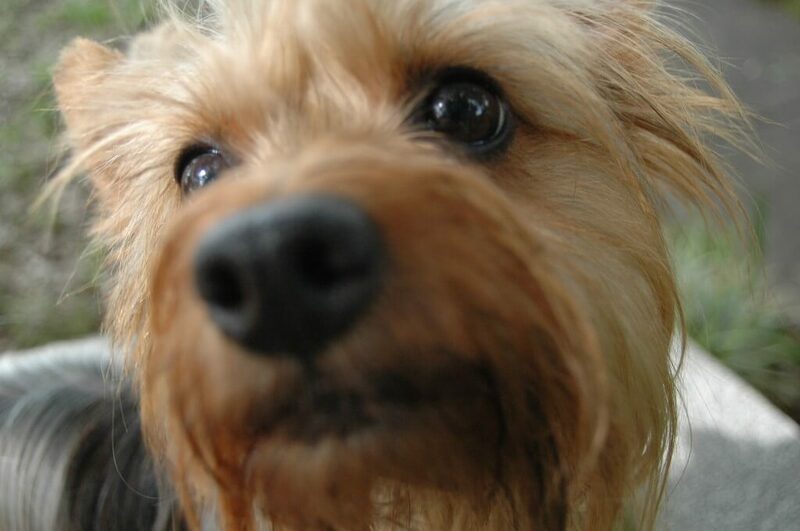 Silky Terriers need exactly the same gentle, positive and consistent training as their bigger cousins. Small dog training is very similar to training a big one; they are just a smaller package. I know how to train small dogs. I have accumulated hard-won knowledge over the last 30 years. This is well behaved Ch. TNT Panama Jack getting ready to give a kiss.